How can one person keep so many important things circulating without them crashing all around them? Sorry, you thought I had a real answer to that question? Ha! So many times my life gets unbalanced and all of the things I love get pushed aside. Right now I'm battling keeping my eyes open and warding off odd looks because I wear a sweatshirt on 100 degree days. Hypothyroidism isn't a problem, unless your medication becomes unbalanced. Mine has. from those who love me, pray for me and just tell me to get off the couch I'd be lost. Sadly friends and family do not start with the letter 'J' so I can't name all of you. But I do thank you for your support these last months. And for more a2z visit Patty Wysong! Cute post, though I'm sorry your medication became unbalanced. Hope you're feeling better soon! My job is one where I must juggle a lot of decisions and tasks and some days, I just want to go cower in my bed. Great post! Hugs, Diana, praying you feel better and stronger each day! Love your post! That one word - joy - is so important. It's our strength, and it drains away, gets stolen, if we're not on guard. Being a woman certainly isn't for the weak, for sure! What would we do without our friends for that umph! we need? Scary, huh? So often I can't keep everything in the air and several come tumbling down. I'm learning how to come to terms with being okay if I can't juggle everything. Great post! Hope your meds get regulated soon. Sure hope that medication gets balanced out quickly for you!! And I do understand the sweatshirt in summer. I'm in a sweater all summer. Praying for supernatural wisdom and insight for your health and medication issues. Joy in the midst of the storm, dear one! Hope the balance comes back quickly. 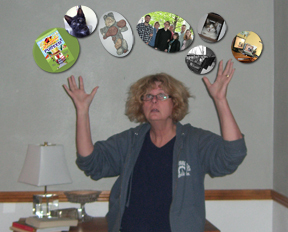 LOVED the juggling picture. What a clever idea. It would make for a great scrapbooking page! Sorry about the medication problem. Hoping it gets leveled out soon. I think we can all relate to the never-ending search for balance in one way or another. --Love the focus on joy!